Since we started living a more minimalist lifestyle, packing for a trip has been a much easier task. 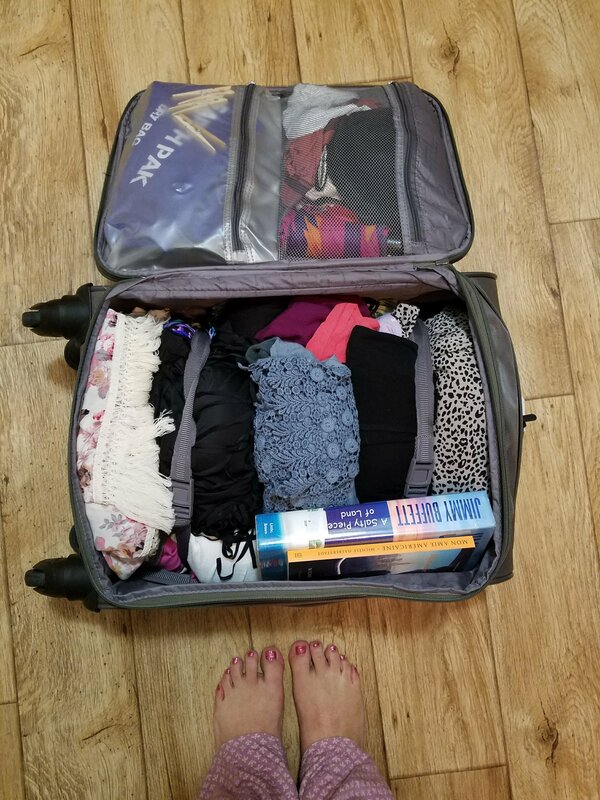 We are preparing to leave for a 7 day vacation and so packing for multiple climates presents a whole set of challenges, but we plan to not let the transition from North Carolina snow, to Caribbean tropical weather get in our minimalist-packing way! As always, we start with our packing list. 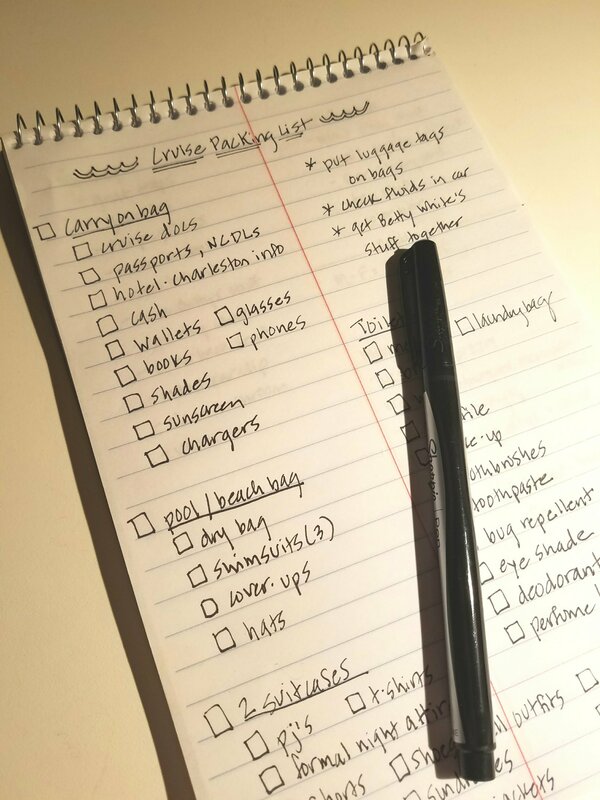 Fortunately, I have a photo (I took photos and scans of almost all of our paper to reduce clutter and waste) of our packing list for the last time we went on a cruise, so I used that as my guide, then minimized some of the items I knew I could reduce. We are going with family, so I checked with each member to see what items we could share, to reduce our own packing. While sharing does present a tiny inconvenience, it’s no biggie when it comes to reducing the amount of luggage we need to take. Fortunately, all of the ports we will be stopping in has similar weather, so that helps with the bulk of our clothing attire. We’ll be driving to Charleston, SC and leaving from there, so the temps will be chilly. Layers are essential! With layers, you can remove each until you get to where you are comfortable. As a frequent flyer in my previous sales job, I was the expert on wearing layers in order to save on packing room, especially with the outrageous prices of checking luggage. I’d often look like I was preparing for a winter storm walking through the Dallas airport, just to save a few bucks. These days, I just pack less. With all of this said, prior to packing less, one must have streamlined their wardrobe. 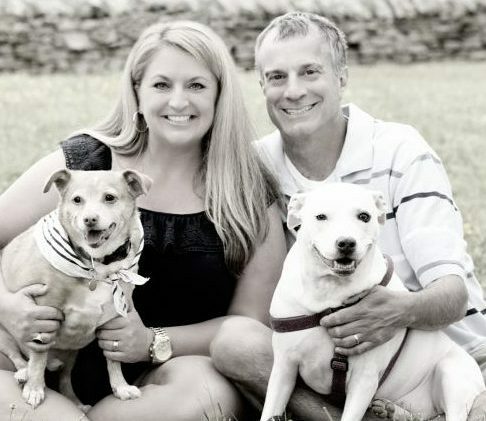 When we downsized and went “Tiny”, we used the Project 333 method, by Courtney Carver. You can learn more about that by clicking the link. When you live in 500 square feet, by the ocean, you don’t need a whole lot anyway. As long as I have some denim shorts, a comfy tee, and flip flops, I’m good! Ger is all about his khaki shorts, tee, and flip flops, too. Needless to say, it does get cold, so we both have attire for that, and some clothes for when a dressier attire is needed, but we have streamlined our wardrobe, for sure. Ladies, (and gents) I know what you’re thinking… but just know, accessories are everything! When packing, rolling your items can save a ton of room. When you roll your items, you can pile those burritos on top of each other. Don’t forget to use the resources you have! We’ve included a dry bag for when we go snorkeling, or any water activities on the islands, so we’ll also use that to store bottled items, like lotions, or makeup, anything that could leak. Similarly for shoes, they can go in a dry bag, or be wrapped in something that won’t show markings or dirt (black attire is your friend), or for thinner shoes you can use the side pockets of your suitcase or bag. Wear your bulky sneakers! You’ll thank me after trekking all over the airports, etc. and for allowing to have extra packing room. Be sure to check with your hotel or cruise line to see what toiletries they have. We surely don’t have to carry shampoo, conditioner, soap, or even a hair dryer or iron since they will be there, so again, more room in the suitcase. We don’t buy souvenirs, with our minimalist lifestyle since we enjoy the experiences, so our cell phones are used to take photos to remind us of our adventures, so we don’t need to save extra room (or carry and extra bag) for things like that. Packing is part of the adventure as we build the anticipation of the trip, so make it fun! We listen to calypso music to get into the mood, while we’re packing. Another Arner Adventure awaits!